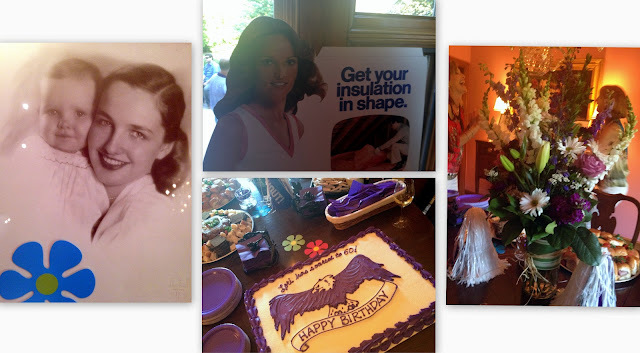 Call Me Mrs. Rapp: Who Doesn't Love a Surprise Party? Even if the surprisee - I make up words and clauses now; my journalism professors would be so proud - claims to not like surprises, everyone always has a blast at these shindigs. This was no different! Leslie and her sisters threw a fantastic surprise party for their oldest sister Lori, and we had so much fun attending it and participating in all the festivities. We chatted with family and new friends, before retiring to the TV room to watch the IndyCar race. If you read my blog you shouldn't be surprised that John dragged us to watch it. I took that time for a lovely nap, before retiring for the evening. But before I did that, here's a little rundown of our evening. For one, there was lots and lots of yummy food. Check out this spread! I became particularly fond of dipping the beer chips - who knew those existed? - into the roasted red pepper hummus. Hello yumminess. Everything else was super tasty, too. And, for those interested, my ensemble for the evening. Happy birthday, Lori! We love you! Seriously?! Any suggestions on what we should do/where we should go!! How fun! !